I’ve taken some time away from cycle campaigning stuff these past few days, partly to get on with some real work, and partly because I was annoyed at myself. I went to the Bow roundabout vigil/protest on Wednesday evening, after having written the article calling for civil disobedience at the event. But once there, I found I didn’t know how to start it. There seemed to be few opportunities to change the planned course of events. The hundreds of people there rode around the roundabout (which had been closed off by the cops for us) and had a minute’s silence. Then after a few megaphone-amplified words from an LCC bod, we were asked to leave as quickly as possible to minimise disruption to the roads. That really annoyed me. I should have shouted something then. I should have yelled out that I was not leaving. What’s the point in turning up to mourn and protest a needless death if we leave without making a fuss? But the moment passed and the crowd was moving away. Looking back, I know I’d have got at least a few voices of support from the crowd. Hindsight is always 20/20. I hung around afterwards there at Bow junction, living the 1960s dream for quarter of an hour or so. The traffic jams cleared within minutes and Bow junction was soon flowing normally. The protest was a kitten’s meow, not a lion’s roar. Most of the drivers in the queues probably weren’t even aware of what was happening, or even that anything was happening at all. It’s clear that I’m not the only one who feels frustrated by the polite meekness of these protests. Enough with the British reserve, at long last someone has organised a protest with some growl. A die-in at TfL’s headquarters opposite Southwark tube station on Blackfriars Road has been organised for 5 to 6.30pm on Friday 29th of November. The event page on Facebook already has over 700 people claiming they’ll attend. Even if half this number show up, it stands a good chance of being a successful and highly visible, headline-grabbing protest. I do think that the protest can be about more than just “cyclists” (there’s that toxic word). In TfL’s world, everybody who isn’t currently in a motor vehicle comes second to those who are, and this movement could easily widen out to include people with disabilities, parents with prams and pushchairs, elderly people who can’t walk fast, people with asthma and other respiratory problems. Do we want to live in cities where everyone drives everywhere, places where walking or cycling is dangerous and deviant? Or would we prefer pleasant communities with a wealth of transport options, breathable air and an absence of death-horror-crash stories in the newspaper? It’s not just TfL, of course – our government is hell-bent on locking us all into our cars and forcing Britain to drive everywhere for everything, all the time. They are predicting that cycling as a mode of transport will stagnate, and will plan accordingly to create the conditions to fulfil their predictions. Perhaps the Friday 29th protest is just the starter, a catalyst that starts a wider campaign off. I’d love to see a broad amalgamation of people who are angry at the way our cities, towns and villages are all subservient to the dictatorship of the petroleum. I’ll be there, and I really do hope it’s the start of something big. By the way, I’ve had nothing at all to do with organising the die-in protest outside TfL HQ, despite rumours to the contrary. I’ll be tackling the “Nazi” thing in a separate post, in case you were wondering. Another death at Bow roundabout. Are we angry yet? The article below is a call to attend a protest at Bow roundabout from 6pm tonight. I’ve previously criticised these things for being too mild, for not causing the kind of disruption – and grabbing the kind of headlines – that the Dutch did in the 1970s. If a “die-in” is to occur then tonight is probably as good a time as there ever will be. 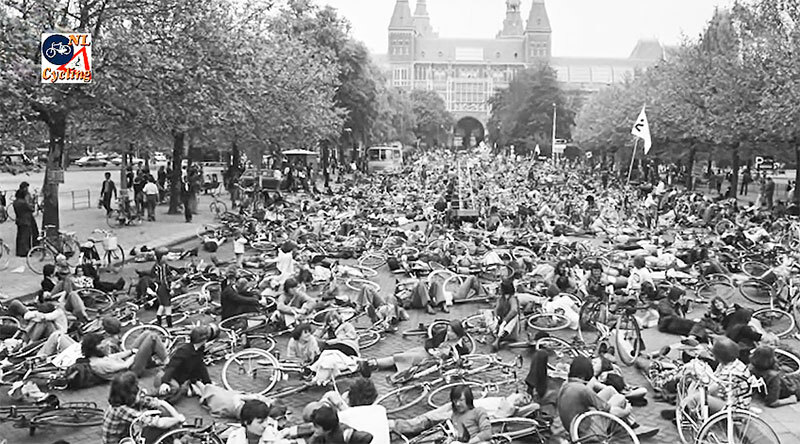 Safer streets campaigners stage a die-in outside Amsterdam’s Rijksmuseum in the mid-1970s. If it hadn’t been for the people in the photo above doing what they did, the Netherlands wouldn’t have the great cycling conditions it has today. Now it’s our turn. The details of today’s cycling death at Bow roundabout are not clear yet. All we know is it involves a left-turning lorry (again). But one thing which is very clear is that TfL’s changes to the layout here are sub-standard. They are not good enough, and they were warned about this. Despite the addition of blue paint and a bit of kerb, the primary function of Bow roundabout is to handle a huge number of motor vehicles. Anything else must be fitted around this core premise. This must change. Even walking around this area on foot is awful, as there are no pedestrian crossing signals. You merely have to guess the best time to cross, hoping that the traffic lights are red and won’t change while you’re in the middle. How are people expected to get around here? Clearly it isn’t suitable for someone who can’t move fast, as even on foot you have to stay alert and nimble. The message is clear: if you want to travel here, get a car. Are we surprised that two thirds of motor journeys in London are under 3 miles long? Today’s death is a shock, a wake-up call, a headline-grabber. What about the pensioners who don’t leave their homes because it’s too stressful to get around? What about the mothers who don’t let their children play outside for fear of an “accident”? What about Britain’s high rate of childhood obesity and heart disease caused by lack of activity? This is about more than just cycling. This is more than just a “cyclists” protest. For every shocking collision there are thousands of untold stories of harm caused by our motor-centric towns and cities. It’s a tragedy on a national scale. The way we’ve designed the areas we live gives most people little choice but to use a motor vehicle, as the alternatives are too unpleasant or unsafe to consider. This must change. Another “always stop” cycle light at Bow roundabout won’t cut it. We need to create safe space for cycling, and safe space for walking, and safe space for prams and pushchairs and wheelchairs and Zimmer frames and tartan zip-up trolley bags. We need space that isn’t subservient to those using motor vehicles, space which allows and encourages other modes of transport. So please do come down tonight. It’s a sad day, but also an angry one. As the Dutch might say, “stop de moord”. It turns out that iBikeLondon was writing a similar post, which includes more details of tonight’s protest. He rightly points out that we’ve been hearing promises from the Mayor and his associates for far too long. The time for action is now.